What’s Big in Vigo, Spain? The region of Galicia in northwest Spain is known not only for being green, rainy, and full of good food but also as a rather rural part of the country. Countless hamlets, villages, and small towns cover the countryside from the western coasts to the mountains in the east. But you might be surprised to know that the 14th biggest city in Spain is found right here in Galicia: Vigo. An important port city on the southwestern coast, Vigo is one of the two major metropolises in the region (the other being A Coruña to the north); nearly one out of every ten Galicians live in Vigo. So what’s the big deal about Vigo? Read on to find out! 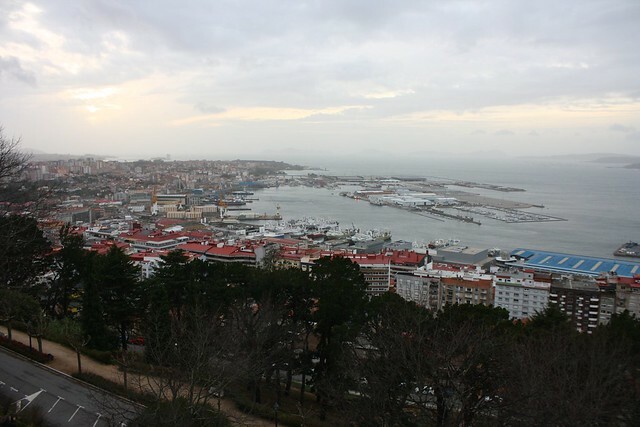 North of the city flows the Ría de Vigo, a narrow estuary or inlet of the sea of the same name. Galicia is famous across Spain for its fresh, high-quality seafood, and Vigo is no exception. 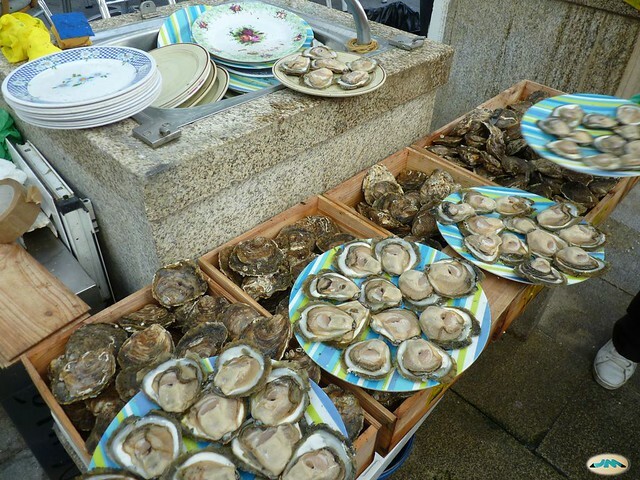 Like most of the western coast, mussel farming is a big deal here, but Vigo is especially famous for oysters that you can buy fresh at the market in the old town. A whole plate of raw, shucked ostras will run you around 12 euros. The taste of these bivalves aren’t for everyone (myself included), but if oysters are your thing, don’t miss ‘em! The main reason Vigo is so, uh, Big, is its historical importance as a major Atlantic port—not only for fishing and as a port of call, but also for international trade and industry. In the warmer months you’ll see cruise ships docked at the estación marítima and all along the coasts container ships wait silently, factories spew steam, docks busily unload cargo, and fish canneries tin away. Although the vast majority of people who live in Galicia can speak and understand the regional Galician language, in the biggest cities like A Coruña and Vigo, you’re much more likely to hear Castilian Spanish than Galician in the streets. For centuries galego was stigmatized as a lower, rural dialect; speakers were stereotyped as being country bumpkins and “civilized” urbanites stuck to standard castellano. 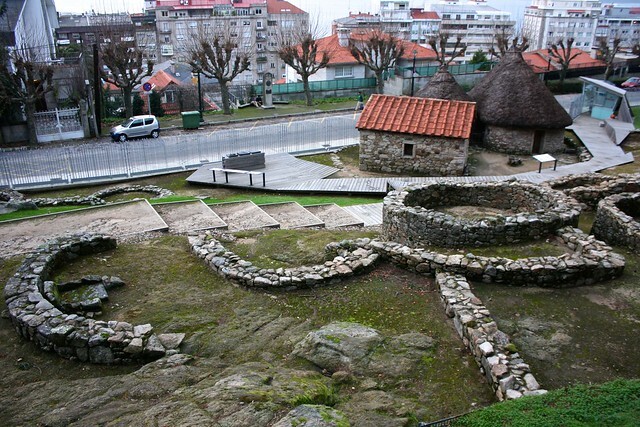 During Franco’s dictatorship, it was even forbidden to speak Galician in public. Nevertheless, the Big City dwellers like Vigo-ites still cling to Spanish, an anomaly in this minority-language region. Fast forward to the late 1400s, when Castilla was torn in a civil war between two claimants to the throne: Isabella and Juana “la Beltraneja.” Nobles from Vigo chose poorly in siding with Juana because Isabella eventually won (and went on to marry Ferdinand of Aragón, sponsor Columbus, etc.). 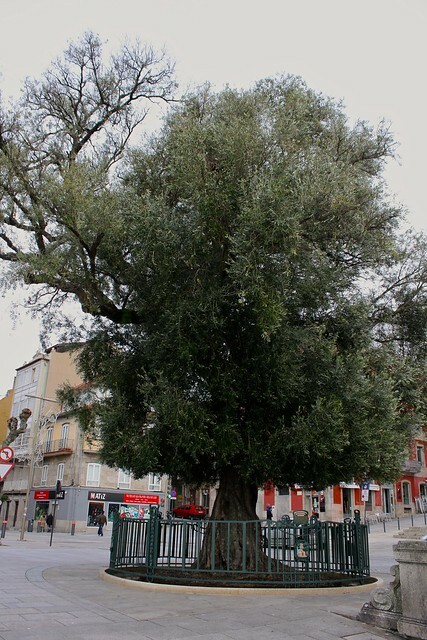 To punish Vigo, she had all the olive trees cut down—but her troops couldn’t touch the olive tree in the church, which soon became a source of civic pride. When the Church of Santa María was rebuilt in the Neoclassical style, this tree came down in the process. Thankfully, though, the mayor saved a cutting from this historic tree and replanted it in his house. Today you can see the descendant of the olive tree behind an iron fence along the Paseo de Alfonso XII. As in the rest of Galicia, it’s common to receive a tapa or small plate of snacks whenever you order something to drink at a bar, café, or restaurant. 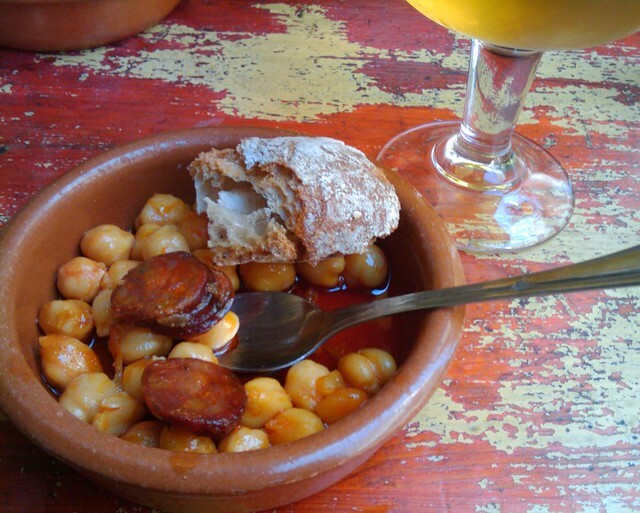 Sometimes it can be a tiny cazuelita or clay bowl of chickpeas and chorizo (as pictured above) or it can be a slice of baguette with a cube of tortilla (potato omelet) on top. If you’ve got an addiction to a thing for croquetas, don’t miss O CROQUEtas in the Praza da Princesa near the old town: since they specialize in croquetas, they give you a couple of them for free with your drink! 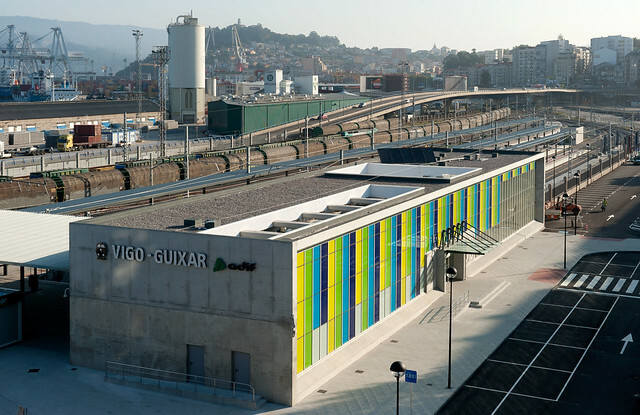 Like A Coruña, Vigo is one of the two major train terminals in Galicia. From here you can catch several long-distance trains by day to Barcelona, the Basque Country, and Madrid, as well as the night train (trenhotel) to Barcelona. Regional trains connect the city with Santiago de Compostela and A Coruña to the north, and with Ourense to the east. Hopefully before the end of the decade the AVE high-speed service will arrive from Madrid, dramatically shortening trips between this distant corner of the country with Spain’s central hub. By the end of this year, though, the stretch of high-speed tracks to link Vigo, Pontevedra, and Santiago should go online. South of Vigo’s tiny old town the Monte do Castro rears up, crowned by a defensive castle and surrounded by a park full of old trees. From up top you can take in expansive views of the ría and try to spot fleets of square bateas (mussel farms) floating in grids. The mountain, though, is named after a castro, or a small collection of circular pre-Roman-era dwellings typically found all over the northwest of the peninsula. There’s not much to see but it’s really cool to have a reconstructed hut side-by-side with some ruins to give you an idea of how the castreixo people would have lived. 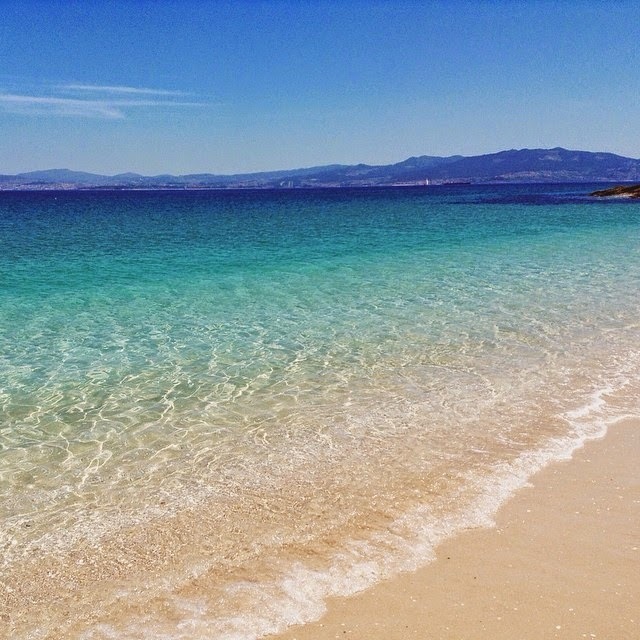 In 2007, the British newspaper The Guardian published an article entitled, “Top 10 beaches of the world,” ranking the Cíes islands off the coast of Vigo as their beach número uno. Galician tourism boards have taken this story and run with it—whether the article was meant to be a serious/definitive judgment of beach quality or not. Still, the Cíes (pronounced “THEE-ays” [ˈθi.es]) are totally worthy of winning the World’s Best Beach contest: these three islands form a nature reserve accessible only by ferry from Vigo and only during Holy Week, weekends in May, and June to September. The Praia de Rodas connects the northern and central islands in a glorious sweep of soft, white sands and pinch-me-am-I-dreaming clear water. You can also camp overnight and there are tons of mountain trails to explore if you’re burned out *ahem* by the glorious beaches. One of Spain’s best-kept secrets, for sure! 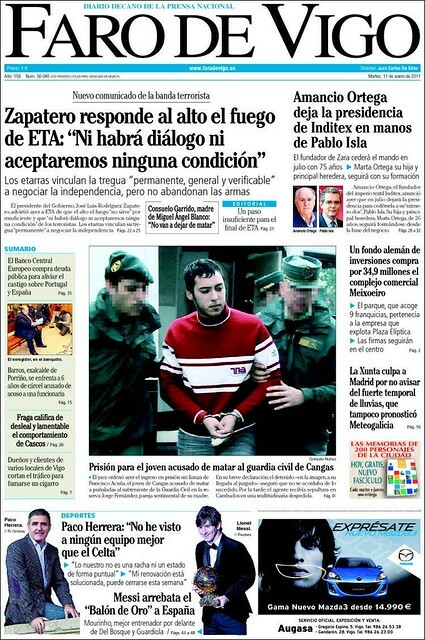 Although the A Coruña-based La Voz de Galicia newspaper is the 4th-most-read daily in all of Spain, Vigo’s Faro de Vigo holds the honor of oldest newspaper in the country. Since 1853 they’ve been churnin’ out journalism for the Vigo area. I honestly can’t say much about “The Lighthouse of Vigo” as 1) I don’t live there and 2) I only buy newspapers to stuff them in my rain-soaked shoes. Have you ever been to Vigo before? Do you think the real charm in Galicia lies in the big cities or the tiny villages? Comment below!